Throughout the Capitol Building, visitors and staff often pause to imagine what is behind the building's smallest doors. Their guesses are as varied as the architectural details that encompass the Capitol campus. The correct explanation for their existence begins with a fire on Christmas Eve 1851. At that time the Library of Congress was housed in the Capitol Building. That morning as John Jones, a guard, was walking on the Capitol Grounds he noticed a flicker through the Library windows. Jones had no key to the room, so he was forced to break the door down. Once inside, he discovered a small fire. Water was not readily available in the building, so Jones had to run downstairs to find some. By the time he returned, the fire had spread throughout the two-story Library. Seven fire stations responded to the alarms. Firefighters worked all day and night and into Christmas morning to extinguish the flames. The fire devastated the Library's collection: thirty-five thousand volumes were destroyed. Approximately two-thirds of the books purchased from Thomas Jefferson were gone. Manuscripts, maps and other artwork had been consumed by the fire, which was later determined to have been caused by a spark from the fireplace in the room below the Library. During the investigation, Jones testified that the fire could have been easily extinguished had there been water nearby. The fear of future fires motivated Congress to fund a critically needed reliable water supply for Washington, D.C.
Small door found on the third floor of the House wing. Captain Montgomery C. Meigs of the U.S. Army Corps of Engineers was assigned by the War Department to manage the project. Meigs had a remarkable career. He helped build many D.C. landmarks, including Arlington National Cemetery, the Capitol Building extension and the modern Dome of the Capitol Building. Arguably his most significant engineering achievement was the Washington Aqueduct. The elaborate system brought fresh water from the Potomac River at Great Falls into the federal city and into the pipes hidden behind the Capitol's small doors. 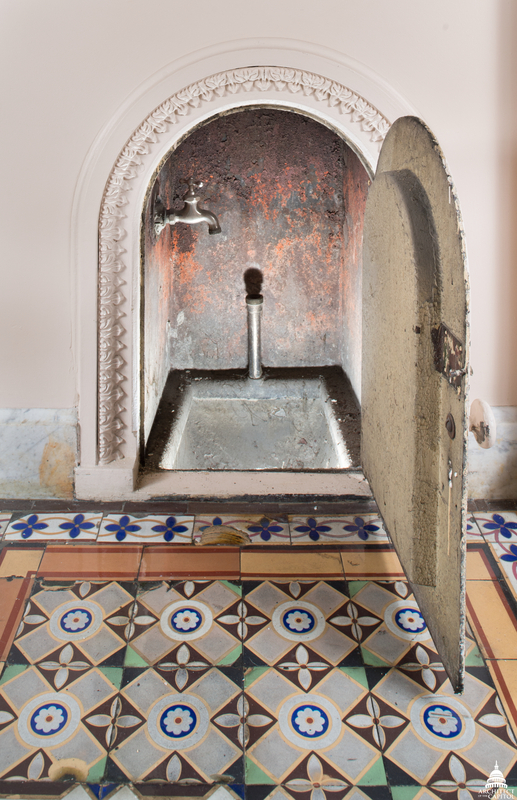 These small doors and the water sources they housed, found in several places in the Capitol Building, were multipurpose. They stood ready to provide water to prevent any future fire from spreading, but they also ensured the mud tracked in from Washington's dirt streets and footpaths could be easily cleaned from the Capitol's floors. That is why the doors stand only about 30 inches tall: they conceal low, shallow closets where workers filled pails of water to mop the floors. Over the years Meigs' water system has undergone many upgrades, but it still carries water into the city today. The Capitol, too, has also undergone many renovations over the years, including more accessible water fixtures and modern fire-suppression systems. 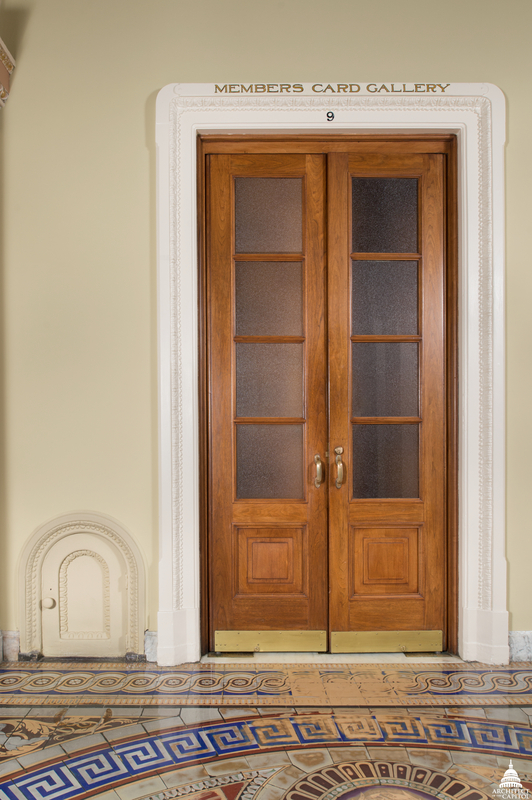 Although the small doors are no longer necessary for their original purpose, they are still very much a part of the Capitol as visitors stop to admire their tiny size and imagine what could possibly be behind them. The AOC team including Jeff Benac, John Yeatts, John Burroughs, David Holmes and Carroll Gayle (not pictured) was awarded the prestigious Washington Building Congress Star Award, recognizing special achievement in visual excellence. The Library of Congress suffered three fires (1814, 1825 and 1851) before moving out of the Capitol Building. Over the years as technology improved, the Architect of the Capitol (AOC) introduced new lifesafety features across the Capitol campus, including the Library buildings. 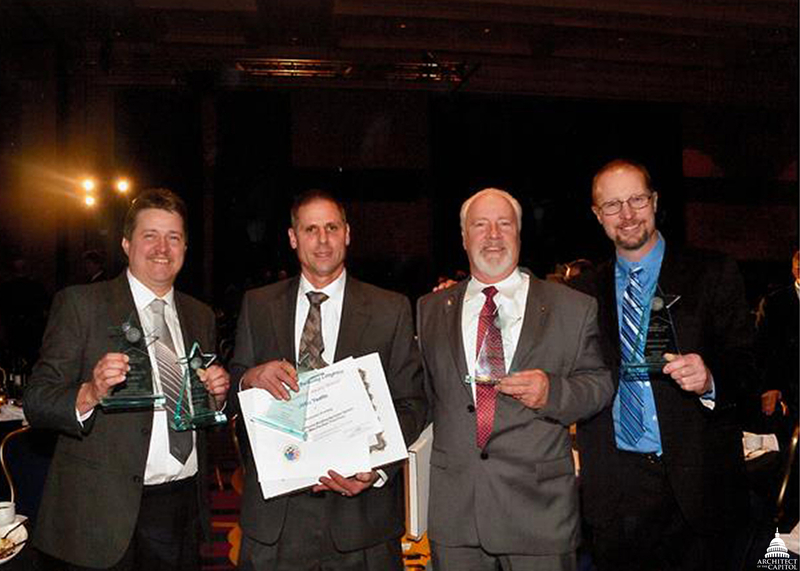 Recently, five AOC plumbers were honored with The Craftsmanship Award from the Washington Building Congress for their work on the Thomas Jefferson Building sprinkler system. The grandeur of the Jefferson Building in its size, scale, use of materials, level of craftsmanship and detail is considered one of America's greatest architectural achievements. Preserving this building, along with all of the other iconic structures on campus, is at the center of the AOC's mission. Sprinkler systems are paramount to reducing the loss of valuable items and lives in the event of a fire, but installing one in such an architecturally significant space was quite challenging. The facility welcomes thousands of visitors each day, so AOC plumbers worked at night removing existing conduit and exposed wiring to accommodate new lighting devices, sprinkler piping and associated utilities. To visually conceal the new sprinkler piping, it was marbleized by Library Buildings and Grounds decorative painters to match the adjacent surfaces. The work took a coordinated effort between the AOC's Historic Preservation Officer, Project Manager, Fire Marshal, Curator, Design Services, Architecture and Preservation Branch, Fire Protection Engineering Branch, Construction Division and Library Buildings and Grounds. The collaborative team successfully achieved its goal to provide sprinkler protection with minimum impact to the historic space, and all were honored to serve a role in preserving the majestic building for generations to come. Spent four years working at the Capitol and never knew this! This is great! Thanks Erin! A long time staffer once told me that the little closets were used to store spittoons in the old tobacco-chewing days. This was a story passed on to him. Excellent article!! History is one of the things that makes the AOC a great place to work. Interesting. The gnome adds a nice touch. Thank you, Erin.